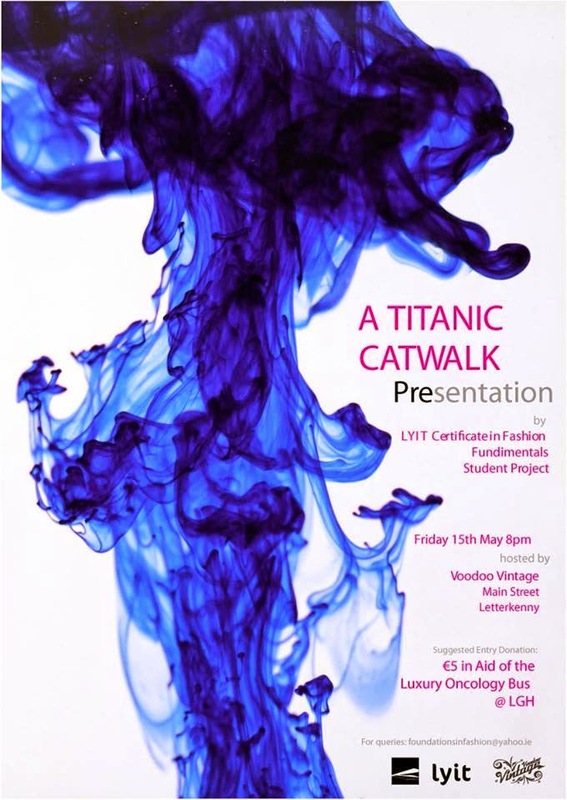 On Friday evening Claire and I ventured back to the hills for the LYIT Titanic Catwalk Presentation. One of my nearest and dearest friends Alan has been involved in the course since Day 1 and we decided that we’d love to go support him given all the years of support he’s given us. Also, you know, anything remotely involving vintage dresses and I’m there. The event was not only to showcase the work of the designers on the course, but it was also to raise money for the oncology unit in Letterkenny General Hospital, and I think they managed to raise over €800 on the night. There were cocktails, nibbles, many spot prizes and above all else, exceptional clothes on display. The whole event was Titanic themed, i.e. what those on board would have worn, so you can imagine the elegant style, the fitted skirts and the elaborate hats that followed. Claire was modelling for Alan, and her dress was based on the iceberg – a huge task, but something that Alan executed excellently. I’m not sure if you can see it clearly from the photo posted above, but the dress was white tie-dye, with blue representing the freezing waters fading into white as it neared the top. A sparked choker gleamed as Claire walked and her lips had a tint of blue – undoubtedly the classiest ice queen to ever have walked the Ink dance floor! One of my favourite parts involved the cupcakes. One of the designers loved to bake (a woman after my own heart) and she made dozens of nautical themed cupcakes for the occasion. Such a cute idea and one which I think I may try and copy once I get some more baking supplies! Now that I’m finished my studies (Imagine! All done!!) I’m really excited to get back into blogging, adventuring and most of all, baking. You’ll be seeing plenty more recipes and posts going up soon! Anyway I have to go – I’m packing for our little class trip to Wexford and I’ve to rummage up a deck of cards from somewhere. I have one job, best get it right.